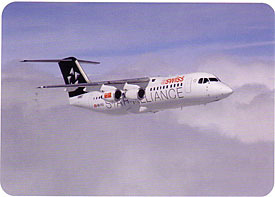 Colin regrets that there is little to say on his favourite subject of current airline issues. By the next edition, anything new from the Berlin World Travel market will have filtered out to collectors, via, among other means, the Gatwick show in April. Meanwhile here are two newish RJ100 cards from Swiss, who, even more remarkably still have cards on offer in-flight. 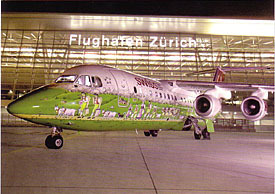 Top, in Star Alliance colours, bottom, at Zurich in a Zurich Airport Shopping promotional scheme.